The last few weeks have been wonderfully exciting times for us! In addition to cooking locally, we have been busy preparing for a political campaign. It is with great pleasure that I let you know that my sister, Rebecca, has filed to run for city council here in Sanford. You can read more about her at www.rebeccaforcitycouncil.com and in the article that ran in the paper this morning. 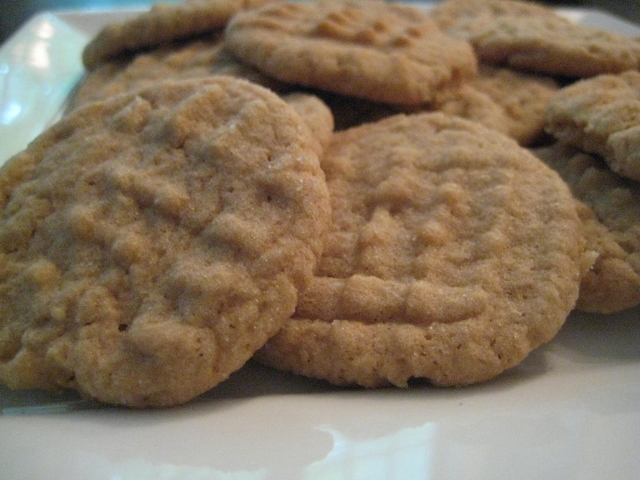 This recipe for Peanut Butter Cookies (adapted from the Pillsbury Complete Book of Baking) has made three appearances in the last week – it is easy to make, includes several local ingredients including peanut butter, and is quite delicious. Set oven to 375F. Beat together sugars and butter. Add peanut butter, milk, vanilla and egg. Mix well. To this mixture, add flour, baking soda, and salt. Stir well and shape dough into 1 inch balls. Roll in sugar and place on ungreased cookie sheets. Flatten in a criss cross pattern with a fork. Bake 10 to 12 minutes until golden. Enjoy! It helps to start with a delicious granola – in this case, the Peanut Butter Chip granola from the Stick Boy Bread Co., one of the producers in the Carolina Grown food co-op. Adding “the perfect blend of almonds, honey, oats, pumpkin seeds, sunflower seeds, coconut flakes, peanut butter chips, chocolate chips, and a touch of almond and vanilla extracts” to any cookie can’t hurt. Here’s the general recipe I used – adaptable to any granola. It was inspired by a recipe from a blog, Milk ‘n Cookiezzz. I adjusted the ingredient amounts to reflect the amount of granola I had. It seems to be a flexible recipe; one I plan to try again. Note to cooks with dogs: be sure to cool the cookies in a place far, far away from the long reach of the puppy…we lost a half dozen of these to a very happy dog!! Preheat oven to 350F, spray cooking sheets with cooking spray. Cream butter and sugars. Add egg and vanilla. In a separate bowl, combine flour, baking soda, salt and cinnamon. Add to the butter mixture, then stir in granola. Place rounded teaspoonfuls on baking sheet and bake until light brown (about 12 minutes).